Hats off to Sharon McLean in British Columbia, Canada, who recently passed the French Wine Scholar exam with an impressive score of 99%! Sharon McLean is a certified sommelier (through International Sommelier Guild), libations writer for Boulevard magazine and the instructor of Wine and Spirit Education Trust (WSET) courses on Vancouver Island for the International Culinary School at the Art Institute. 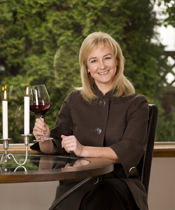 In 2009, she completed the WSET Diploma with the highest marks in Canada. Since then she has gone on to become a Certified Sherry Educator, is currently a second year Masters of Wine candidate... and just earned the French Wine Scholar credential! The FWS is also thrilled to welcome Sharon as part of the team of instructors teaching the FWS program at the International Culinary School at the Art Institute in Vancouver. "I talk about France all the time to my students and in my seminars, so it was great to have such up-to-date information in the FWS course materials. Having access to the high quality online tutorials and webinars was excellent and appreciated. I'm looking forward to Master-Level Programs."